Hello, I've been hanging around this forum for over a year but this is my first post. I'm trying to design and build a scanner specifically for old books (printed as early as the late 1400's). The interesting challenge here is that many of these books are quite large. A quick history lesson for those of you who are interested: up until the 1800s book printers didn't bind books; a person bought the book in looseleaf pages and had it bound by someone else. So, thrifty people would buy several books and have them all bound in one cover. This results in some pretty big books. Multiple books, combined with thicker paper and wooden covers made books with 6-inch or thicker bindings fairly common. Anyway, I'm a huge fan of Daniel's new build with a fixed platen, and I'm planning a similar build, but able to accommodate much larger books. I want 8-10 inches max spine width and pages of something like 20" x 24". With such wide books, I was intrigued by Daniel's mention of a self-adjusting spine support system. I did a little study of one sample book in my library (Lewis and Short's Latin Dictionary) and threw together a possible model in Blender. I'm hoping to get some critique from the seasoned vets and engineers here on the forum. The book in this first picture shows the problem when a large book is open with the spine flat. The problem is the cover is open to the proper angle, but since the pages are attached to the spine they come up perpendicular to the floor before curving over to the desired angle. The second picture shows that if the spine were lifted up on the "thin" side, then the pages line up with the covers just fine. What we need then is a system that raises one side above the other as you go. I put together one idea using blender. This changes a few things about the way books have been held, so I'm hoping I haven't overlooked anything stupid. It's a fair amount more complicated, but since these are historical books I want my scans to be as clear as possible. I haven't modeled the whole scanner yet, just the cradle, and scale is not accurate in any way. 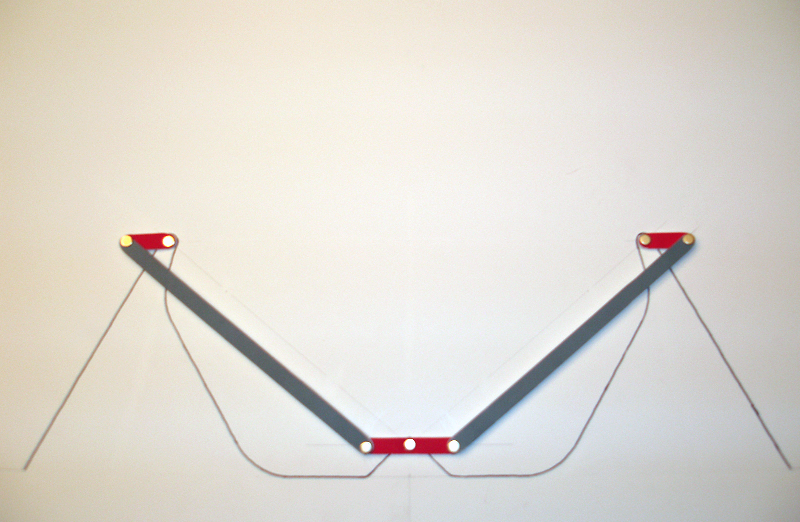 I plan to lift the entire red frame with a counterbalanced lever. The big difference here is the support system. The supports for the two sides of the cradle are fixed in relation to each other. Instead of adjusting the whole side by sliding it horizontally, the plywood cradle pieces can be adjusted along their supports. I think a couple metal brackets with wingnuts would allow this to be done without too much pain. The nice thing about this is that the farther out they are adjusted, the more roll it allows for, which is exactly what I need. The two sides then float up and down with the weight of the book. Underneath, there's a simple lever system to balance out the two sides. Springs could be added to get it to default to centered. So there are two things I can think of that still need to be solved. The first is that the spine itself is still unsupported. Maybe I could put some kind of hinged piece between the cradle pieces that would adjust along with them. See, now both sides are curved with the spine. For many books, including this one, I could stick a piece of PVC under it to support it, but if the spine is made of wood, I don't think I'll be able to do anything with it. I suppose that's where software comes in. I would appreciate any thoughts and advice. Outstanding first post! Welcome! This is exactly the kind of visual exploration of spine support that needs to happen. I'll try to spend some time drafting up my ideas tomorrow night. I finished the Blender model of my scanner (at least to a beta point) and I thought I'd post it in case anyone would like to play with it. I'm a self-taught 3d artist, so I may have done some things completely backwards, but Blender is a great tool for visualizing things (and it's free!). I put in some rigging to control the movement of the various scanner parts, so try it out and see what you think. You just grab those controller shapes and move them around. Please let me know if you open it up and anything is broken. Scheme for a self adjusting cradle. I suspect the spine itself won't need supporting as long as the book is free to move. In the drawings below the cradle boards are each on rollers and linked together so that as one rises the other falls. The link is at the back of the cradle. The first drawing shows the cradle position with the middle of the book open. The second drawing shows the cradle position with the book open to the first few pages. I think this type of cradle should be able to accommodate books of various thicknesses without manual adjustments. A sheet of rubbery kitchen shelf liner is placed on the cradle so the book doesn't slip. This is how I plan to solve this problem on the scanner I'm currently designing. The cradle is made up of three pieces: the spine support and the two sides. 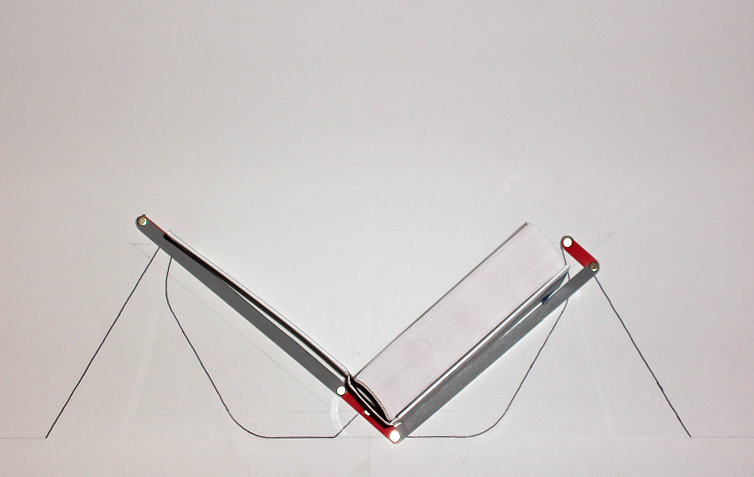 The sides are attached to the spine support with a sort of hinge (long 3/16" hinge pin). The spine support can also rotate about a long hinge pin through its center (longitudinal axis) that is also attached to a tab off of what I refer to as the cradle base at each end. At the top of each cradle side there are short link arms that attach to the side and to a pivot point on the cradle base. The width of the spine support matches that of the book you wish to scan. The length of the short link arms is the same distance as half the width of the spine support. 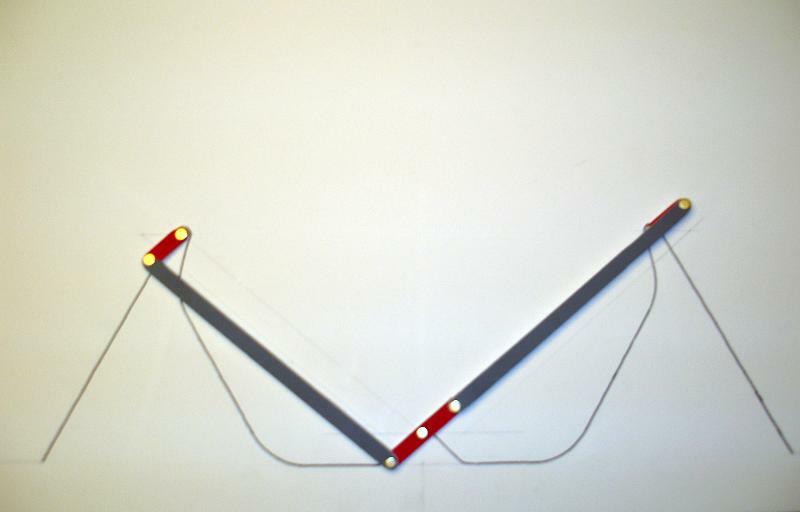 This configuration results in each of the cradle's sides as being the long arm of a parallelogram. As the spine support tilts, the cradle sides also move but the angle between the two sides will always remain the same which ensures that the platen will contact the pages properly throughout the scan process. This does require that the width of the spine support member change depending on the thickness of the spine of the book being scanned. That can be addressed by having a number of holes in the spine support end piece and moving the hinge pin to the proper set of holes. You could also do it with a rod and setscrew setup or maybe a sort of turnbuckle. The length of the short arms would also need to change accordingly and can be addressed in the same manner. One thing to note is that while the short link arms hang over into the area inside the cradle sides, the platen will never hit these because the thickness of the book extends off of the cradle side farther than the end of the link. When there are fewer pages on one side of the cradle, the cradle side becomes collinear with the short link arm on that side. Kind of cool how that works out. 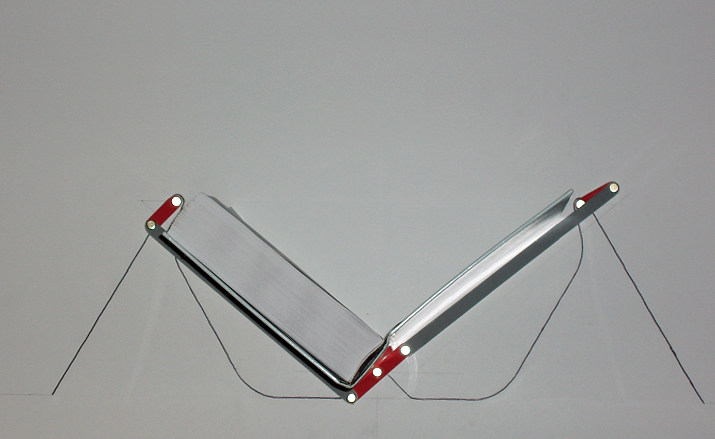 Of course you could also make the platen so that the glass would never extend beyond the cradle edge. Enough talk. Here's some photos of a mock layout I made on some poster board with brads as hinges. 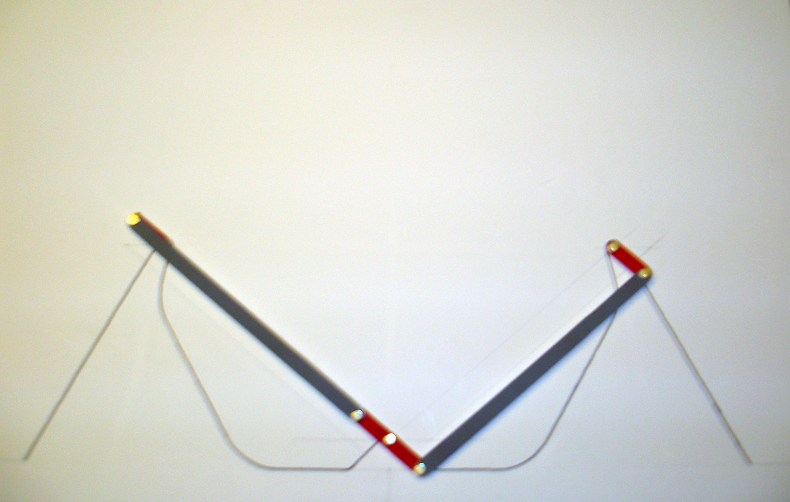 The spine support and short link arms are red. The cradle sides are gray. The cradle base is outlined in black on the white poster board. Last edited by dpc on 31 Oct 2011, 16:22, edited 1 time in total. Last edited by GaryK on 17 Dec 2011, 14:39, edited 1 time in total. LOL! Oh, wikipedia. Is there anyone you can't make laugh? as each is pinned in relation to the other . I haven't finished visual-eyes-ing it yet, but (2) may need to be shorter than (1). I''ll be pursuing this idea for my own this week, in the realm of flesh, blood, & sawdust.